A trim figure is just as important to men as it is to women. Unfortunately, busy lives, stress, and a poor diet can all cause unwanted fat to collect on various areas of the body, fat that is resistant to exercise and diet. Liposuction is the surgical process of removing unwanted fat cells so that you can achieve a toned, sculpted, and masculine appearance. What Can Male Liposuction Achieve? Having a toned and sculpted midsection is at the top of the priority list for many men. Unfortunately, stomach bulges, love handles, and “beer guts” tend to appear all too readily. Liposuction removes unwanted fat from the midsection to leave you with a more defined abdomen. The hallmarks of a masculine physique often include tone and definition along the chest, back, arms, thighs, and jawline. All of these areas can be difficult to maintain. Liposuction allows men to attain the masculine physique they want without countless hours at the gym. There is a misconception that only women care about the appearance of a slim and toned body. Having excess, unwanted pockets of fat on your body can be just as emotionally damaging to men. Liposuction allows you to say goodbye to unwanted fat so that you can feel pride in your new physique. To begin your liposuction treatment, either local anesthesia with sedation or general anesthesia is administered, depending on your personal preference or whether a combination procedure is performed. Following this, small incisions are made near the treatment areas and a thin, hollow tube is inserted. This tube loosens the unwanted fat cells before suctioning them out using a vacuum device. Once the fat is removed, the incisions are closed using sutures. Tummy tuck: A male tummy tuck, or male abdominoplasty, is traditionally performed on men who have lost a significant amount of weight. 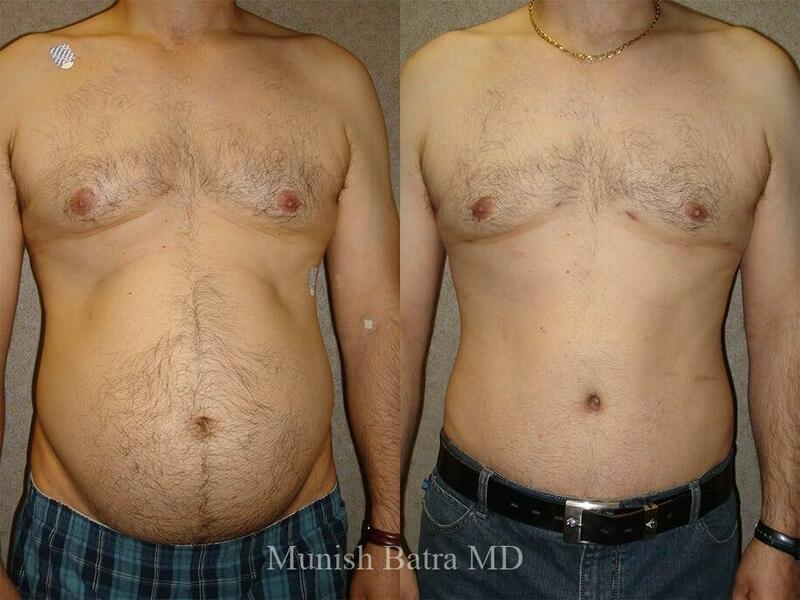 Tummy tuck surgery trims excess skin and tightens abdominal muscles to create sculpted, toned, and masculine contours. Gynecomastia surgery: Gynecomastia is a condition defined by the presence of excess tissue and fat that leads to male breasts. Liposuction reduces excess fat in and around the breast area. Arm lift: When liposuction is performed on the upper arms, there is a chance that excess skin will be present. In this situation, an arm lift is performed to remove excess skin and reveal a toned, sculpted upper arm. Thigh Lift: Thigh lift surgery removes excess skin that may be present on the inner and outer thigh after weight loss or liposuction. Following your procedure, you will need to have someone there to drive you home and stay with you for the first night. All treatment areas will be wrapped in a compression garment that will reduce swelling, promote blood circulation, and assist in the healing process. Most patients feel like returning to work and their daily routines within one week; however, men with more physically strenuous jobs or lifestyles may require additional time off. Bruising, swelling, and soreness in the treatment area are expected. Oral medication will remedy any pain, and all discomfort should dissipate within a few weeks. As with any surgery, scars will form at the incision sites. Fortunately, the incisions made are tiny and tend to be unnoticeable. Any scarring that is present can be reduced by using silicone scar sheets and minimizing sun exposure and tension during the healing process. All scarring will fade with time. The cost of your liposuction will vary depending on the number and size of the treatment areas as well as factors such as anesthesia, surgical, physician, and facility fees. Dr. Batra and the staff at Coastal Plastic Surgeons will provide you with a detailed cost estimate during your consultation. Ideal candidates have localized pockets of fat that are resistant to diet and exercise. Candidates should be in good overall health, have good skin elasticity, be non-smokers or willing to quit smoking for one month before and after surgery, and have realistic expectations of their results. How does liposuction differ from traditional weight loss? When you lose weight through traditional methods such as diet and exercise, you are reducing the size of your fat cells, but you are not eliminating them. Liposuction surgically and permanently removes these cells. Does liposuction address excess skin? Liposuction only addresses the excess pockets of fat. It is unable to tighten or remove excess skin. It is for this reason that patients with a significant degree of skin laxity may not be candidates for liposuction alone. What are the potential risks associated with liposuction? To reduce these risks, be sure to follow all of your surgeon’s post-operative instructions. With over 20 years of experience in body contouring procedures, Dr. Batra has the knowledge, training, and skill necessary to provide you with your desired results.